Our Estuary, the largest in western North America, encompasses San Francisco Bay and the Delta of the Sacramento and San Joaquin rivers in California. 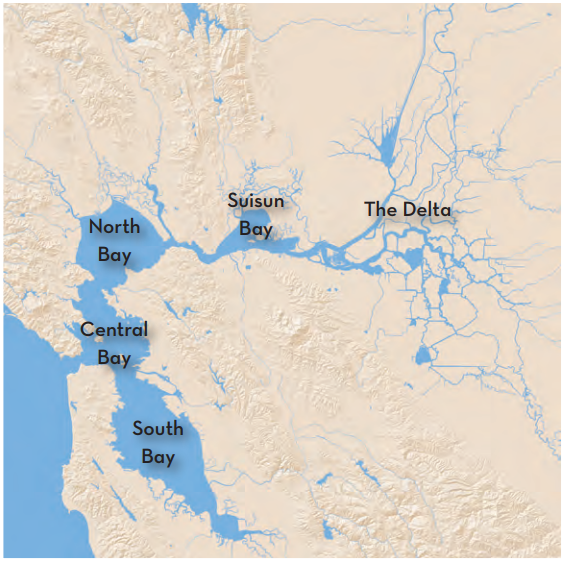 Unlike most estuaries that spread out into a wide delta of braided channels where rivers meet the sea, the San Francisco Estuary’s Delta is more than 60 miles inland, trapped behind coastal ridges after rising seas flooded the Bay 10,000 years ago. Managers often divide this complex water body into the Bay and Delta, or the upper and lower Estuary. 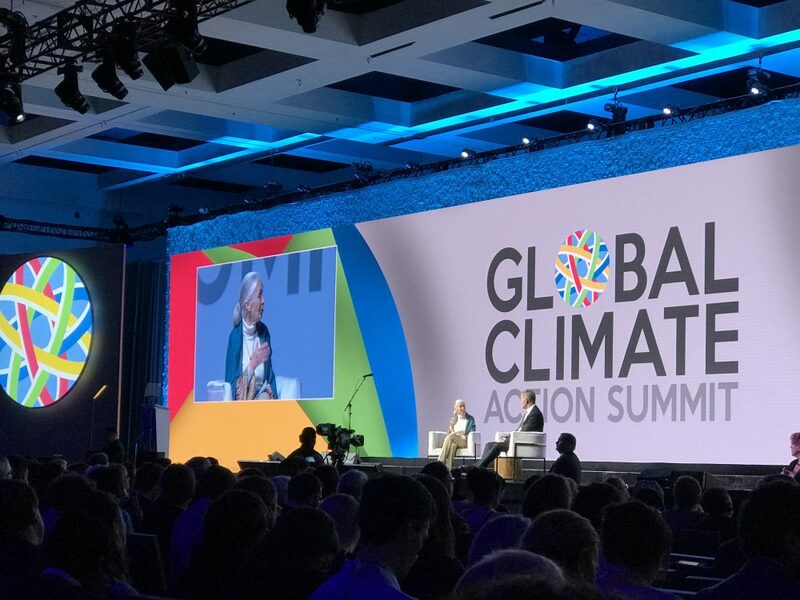 It is all one system, however, connected by freshwater outflow to the pacific and by the ebb and flow of ocean tides far upstream into the Delta. 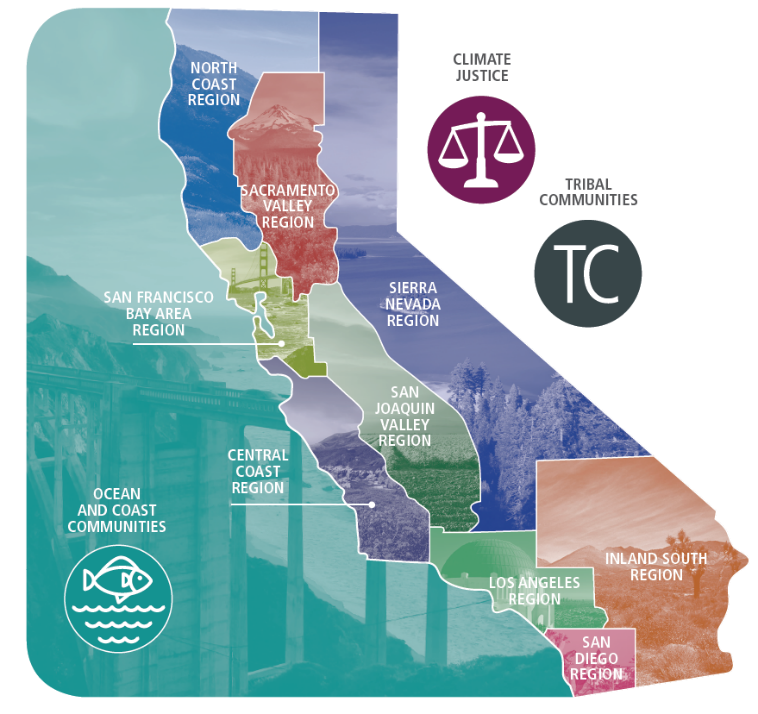 The Estuary’s watershed extends from the ridgeline of the Sierra Nevada mountains to the Golden Gate, including almost 60,000 square miles and nearly 40% of California. The Estuary’s waters and wetlands are a biological resource of tremendous importance – providing critical winter feeding habitat for over a million migratory birds, a productive nursery for many species of juvenile fish and shellfish, and a year-round home for a vast diversity of plants and animals. Half of California’s surface water supply falls as rain or snow within this region. San Francisco Bay includes four smaller bays. The farthest upstream is Suisun Bay, which includes a vast area of marshes. Suisun Bay lies just below the confluence of the Sacramento and San Joaquin Rivers. Suisun and its neighbor San Pablo Bay, sometimes called the North Bay, are surrounded mostly by rural areas, and are strongly influenced by freshwater outflows from the rivers. The Central Bay is the deepest and saltiest of the four bays. Cities and industries occupy most of its shores. The more shallow South Bay extends south into quiet backwaters surrounded by restored marshes, salt ponds, and office parks and lagoon communities. Upstream of the Bay, the Sacramento-San Joaquin River Delta is a 1,000 square-mile triangle of diked and drained wetlands. Small remnants of once-extensive tule marshes still fringe the channels that wind between the flat, levee-rimmed farmlands of the Delta’s myriad islands. Before it was diked and drained, the Delta gathered in the fresh waters of the Sacramento, San Joaquin, Mokelumne, and Cosumnes rivers and moved them all downstream through a complex array of channels into the San Francisco Bay. Today, the Delta, with its rich farmland, is the engineered junction of one of the largest plumbing systems, where much of the system’s fresh water is diverted to supply California’s population centers and Central Valley Agriculture. How Healthy Is The Estuary? The 2015 State of the Estuary Report provides a comprehensive report for the Estuary. What Will It Take to Achieve A Healthy Estuary? A healthy Estuary needs more freshwater flows through the system, more flooding in the right places, more space for habitats and species and connections between those spaces, more sediment moving through watersheds, and less hardscape, among many needs. A healthy Estuary also needs more monitoring of estuarine conditions, as well as funding to learn from and adapt to what works and doesn’t work in restoration and intervention. The 2016 Estuary Blueprint provides four long-term goals and 32 immediate priorities for achieving a healthier Estuary.